Park Shin Hye looks so grown up and elegant in this editorial for Elle Korea. The pretty actress is a youthful 26 and she is celebrating her 13th anniversary in the industry this year. Shin Hye debuted at 13 playing the younger version of Choi Ji Woo's character in the drama Stairway to Heaven. She recently posted a cute reunion photo with Baek Sung Hyun who portrayed her love interest/the teenage version of Kwon Sang Woo's character. The two are both appearing in the current drama Doctors which I have zero interest in watching. Too bad they don't share a love line. I've always liked Shin Hye. She hasn't necessarily challenged herself much as an actress up until now but it sounds like she is finally doing so with Doctors. And I admire that she never gave up on her education even while working. She started college in 2008 and graduated from Chung An University last year with a degree in Theatre and Film. She looks truly enchanting here. The hair and makeup for the cover are perfection. The shots with the extra long hair extensions are OTT and a little too fake feeling for my taste but the one where she's laying on the ground with the petals is super pretty. This InStyle editorial set in NYC is still my favorite one with her! She is so pretty and her hair is stunning. 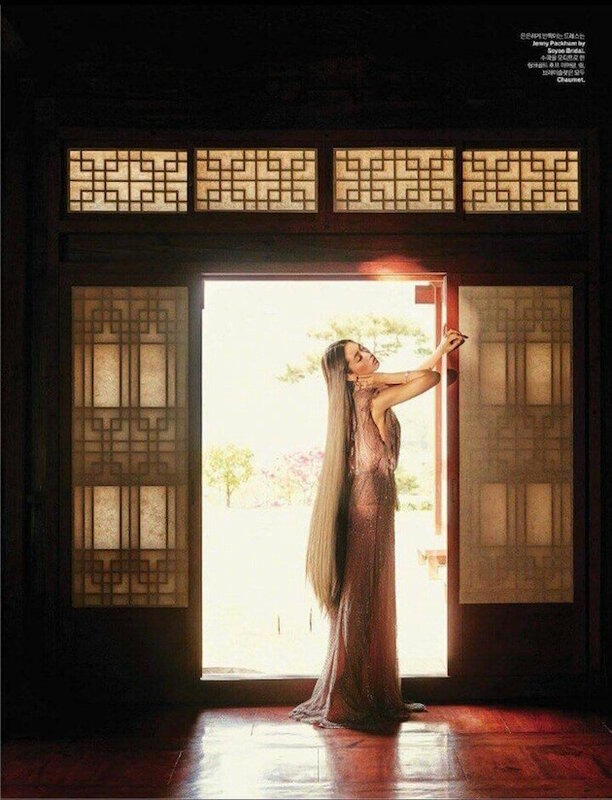 Mesmerizing photographs...I actually like the fake hair in this editorial, it makes it more mystical and kind of takes me back into history. The location is quite stunning. Beautiful editorial, thanks for sharing. It is great that she didn't give up on her education. So many stars choose not to study just because they become famous and I think that's just not a good message for their young fans. Education is important and it is always good to see people who understand that. 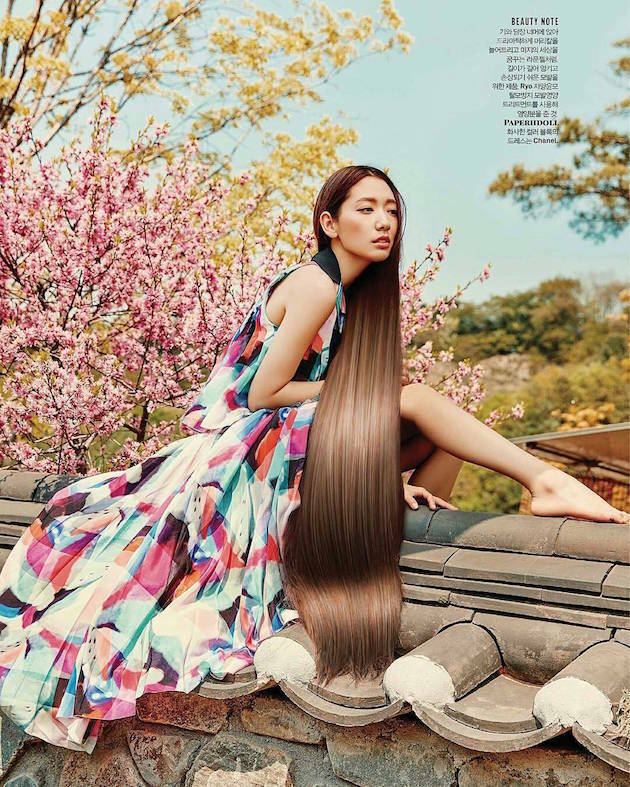 Beautiful hair amazing the length of the model with the long hair. Have a great weekend. Ooooh this editorial is quite interesting, with the fake hair and all, nonetheless, still showcasing Park in a beautiful light. Yes, she does look very matured here with those smouldering makeup and hairdo. I especially love that all-white floral motif dress that she is wearing. I think this is the second time you mentioned you have no interest at all to watch Doctors. Actually, the first 3 episodes were really good, beautifully shot and the focus of the story is very much human aspects and building the relationship dynamics between the main characters (mainly all the flashback scenes). I do see that Park is attempting quite a different role this time around, like you said here, taking up a bit more challenging role. Oh, and I really do find her so pretty in this series, since I heard she lost weight to play this role, though I also read a lot of backlash comments about her being too skinny and looking "old" haha... one can never satisfy the whole world. I wish fans could just be matured enough to look beyond all these matters. Thanks for sharing this, your eye candy is always a fun read, Rowena. Woot woot! She looks so fine in this editorial, and yeah....I'm like some of the commenters. I actually do like the one with the super long hair just because she reminds me of a mermaid in these shots. But really, she's just gorgeous she'd look good no matter what IMO:D And I also admire her for finishing her education. Her hair in the last pictures is so pretty! I have been meaning to grow out my hair for ages, but I feel like it is not going to happen anytime soon. I saw her grow up too through her dramas! I loved her when she was just a little bit chubbier! Amazing editorial, crazy beautiful hair! I love this editorial. The photos are enchanting and she looks amazing. Ohh, that is refreshing to know an actress who didn't give up her education which is one of the many reasons I love Emma Watson too. Too many that forgo educations as soon as they become famous which is unfortunate as the industry turns around so fast that it would have been better to have something to fall back to. Maybe I'm old school but I strongly believe in having a good education to fall back to. I would agree a couple of hair extension shots are OTT, though the ones seeing her lay down with flowers placed in her hair are SO beautiful - what stunning photography! 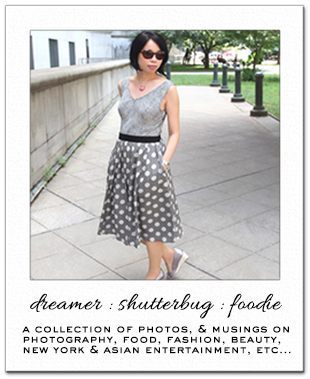 Thanks for sharing this Rowena, the editorial is really inspiring. This is a stunning editorial and I love the shade of her natural hair. Glad to see she is pushing herself as an actress and I agree the hair extensions are freaky long and look photoshopped, it is distracting and takes away from the over all editorial images except for one where she is laying down in the grass that one is not so bad. Yes it was great to meet up! I used one of the polishes today. Yes we should get together again in the fall. So wonferl pictures my sweet Rowena. The hair looks superb and so does she! I love this hair, great post. Ohhh wow her hair looks stunning! Her hair is absolutely stunning! Love this editorial - she looks so elegant. She is absolutely gorgeous! She doesn't look 26 at all! Looks so much younger. What I admire about Asia actors & actresses is that they are so well rounded. I think it's awesome she got her degree, and still pursued her dreams. Yikes! Those extensions are super long! I loved the editorial with her with the very Audrey Hepburn look. I remember seeing them here! And I'm not watching Doctors either and I'm actually not watching a lot of dramas from the traditional networks (SBS, MBC, KBS) but instead on the cable networks, especially TvN. The dramas on those up and coming networks are really killing it!